This Fabulous 5 Cuddle® kit includes 5 pre-cut 10" strips for the quilt top, pattern, & binding. Approx. size is 38" x 58". Choose from a variety of style options using the five 10" strips. (Image shown is just one option available). After you cut each strip into assorted sizes you will follow the sewing directions in the Stitch and Sew method. Binding included. 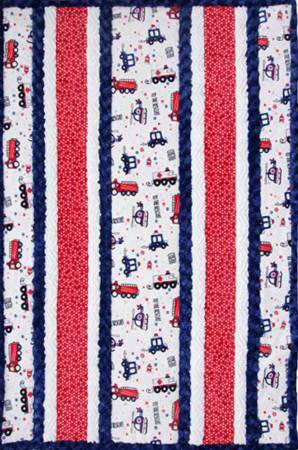 Suggested backing for this kit is Scarlet, Royal or Dusty Blue Cuddle3® or Cuddle Dimple®. 1 1/8yd of backing fabric is needed.